The world renowned and spectacular transgender beauty pageant, Miss International Queen 2015, has officially kicked off on Friday, 30th October at Central World, Bangkok, Thailand. A total of 27 contestants from 17 countries will compete with their beauty and talent under this year’s theme, INSIDE OUT. Also, for the first time ever all 27 ladies meet with the press and immediately compete for the first round contest of Miss Best Talent. For the Best Talent winner, the prize goes to contestant #21, Taliah, from Australia show title: Belly Dancing. The winner for miss Best Talent takes home Thb30,000 (approximately USD 1,000), Trophy, Gift Voucher from Pratunam Polyclinic, Cosmetic gift set from Mistine Cosmetic, gift voucher from V Plast Clinic, and a gift set from Snailwhite. Walking down the aisle in their national costumes, the 27 ladies showed off their most grand, creative dress designs. The winner will be announced on the Crowning Day, with a prize of THB 40,000 (approximately USD 1,300), Trophy, Gift Voucher from Pratunam Polyclinic, Cosmetic gift set from Mistine Cosmetic, gift voucher from V Plast Clinic, and gift set from Snailwhite awarded to Miss Best National Costume. It’s been 11 years since the stage managed by the Tiffany’s Show, Pattaya has given the world Miss International Queen. This pageant is the pinnacle for many, representing the pride and joy of all of those taking part in this pageantry. This year, in 2015, contestants come from different races, languages and cultural backgrounds such as Mexico, Belgium, Brazil, Italy, Turkey, Australia, Japan, Vietnam and Thailand’s very own neighbor Myanmar. There are 10 awards worth over THB 3 million. Among the many competitions to be won, some include Best Evening Gown, Miss Photogenic, Ripley’s Popular Vote, Miss Friendly AirAsia and Best Introduction Video. 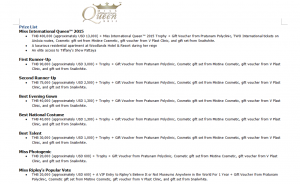 There are also special awards from the public which include Best INSIDE OUT Final Question, which shall be put to the three ladies who make it to the final crowning round of Miss International Queen 2015 on 6th November at Tiffany’s Theater Pattaya. For over a decade, “Miss International Queen” has been the platform for equal opportunity; for transgender to express themselves and their talents. 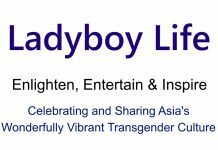 Stepping into its second decade, the pageant now brings with it a significant change in perception of transgendered women and acceptance amongst the world community. 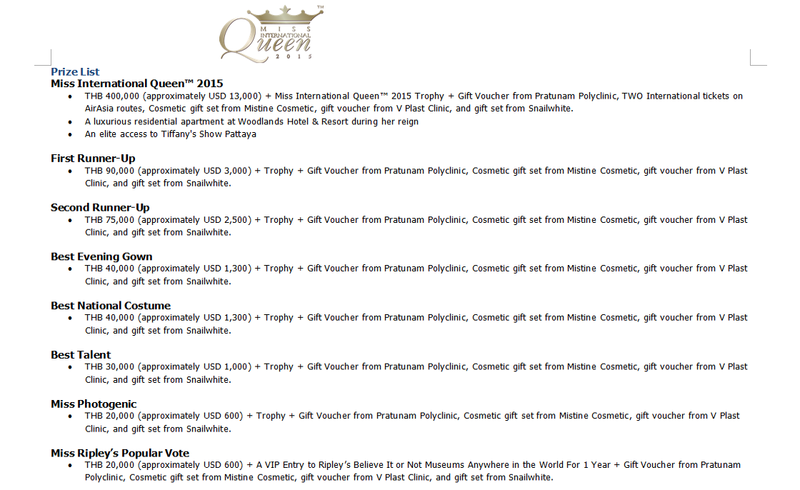 Note: See images below for contestant details and the prize money list for Miss International Queen 2015. Alisa Phantusak, Chairman of the Miss International Queen pageant, stated, “Miss International Queen travels well into its second decade with warm welcome and generous supports from a great number of contestants, sponsors, members of the press and of course the public, many of whom have followed and witnessed the positive changes reflected in the perception towards transgender that we are proud to have supported throughout. Tiffany’s Show Pattaya is proud to be an integral part of this wonderful development which is also important to the tourism promotion of the country of Thailand and of Pattaya City”. Associate Professor, Dr. Seri Wongmontha, honorable advisor and Chairman of the Judging Panel said that in his view, for this pageant, every contestant must have beauty, the kind that shines from within, according to the concept: Inside-out which celebrates the four paradigms of beauty. The first is Spirit meaning the cradle of how you become who you really are today, forgoing one’s self and sacrificing for others. The second is Heart that is full of kindness and good wishes for mankind which needs positive attitude to live life. This works hand in hand with strength of the third that is Mind which requires good thinking, wisdom and being a smart leader with smart behavior, making the right decisions for a smart life, all while maintaining a beautiful attitude and sweet manner. The kind heart in a good person is a heart that wishes others people well, and one that allows her to live life happily as a happy person. This good heart is the kind of beauty that is beyond the body. It is the beauty that shines from within that entices everybody to embrace her being. It represents the best of humanity within; and celebrates the equality we enjoy in today’s society. The final round will be held on Friday, 6th November 2015, at Tiffany’s Theatre Pattaya. A live telecast starts at 23.00 on channel 7. The total reward money is worth over THB 3,000,000. You can be a part of this pageant by voting for your favorite for Miss Ripley’s Popular Vote via http://www.missinternationalqueen.com. 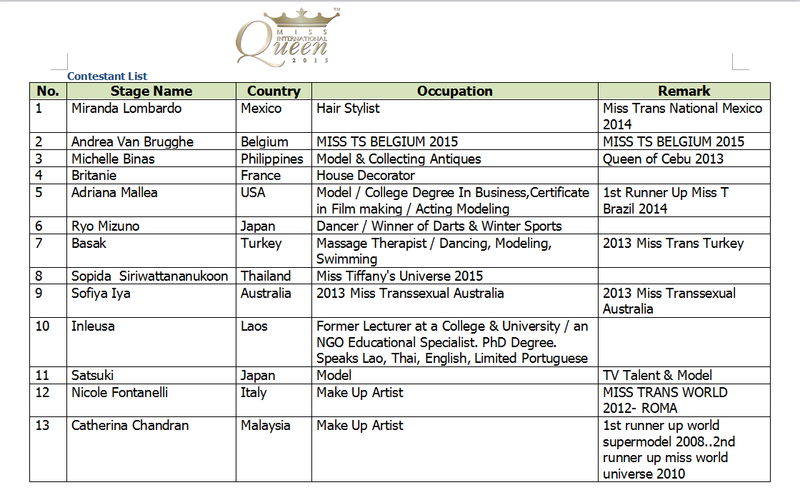 You can also watch live broadcast online via http://www.missinternationalqueen.com starting from 21.00 hours. Tickets are available at Tiffany’s Theatre Pattaya, Res@Tiffany-show.co.th, or at Thai Ticket Major. 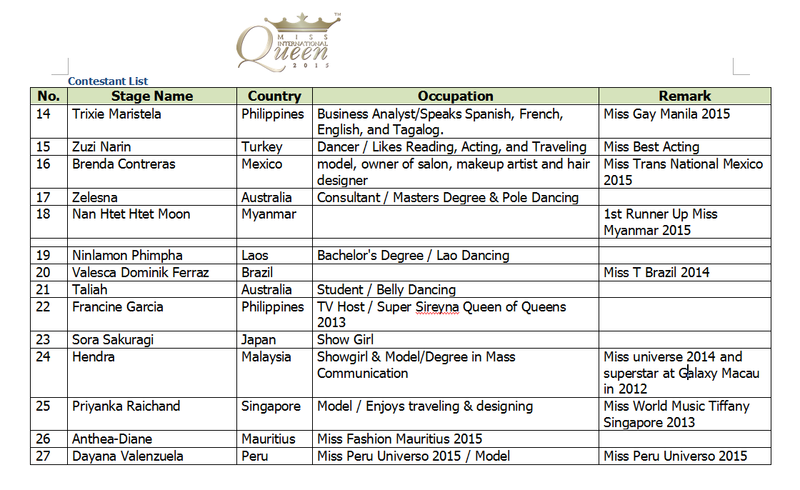 For more information call at 038-421-700 to 5 or visit http://www.missinternationalqueen.com.